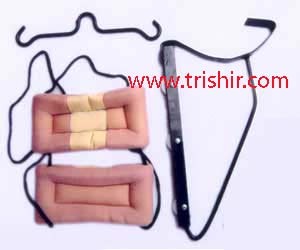 Cervical Traction Kit ( Cervical Pulley ) - Complete Kit Traction Pulley, Head Holder, Spreader Bar and cord. This is portable pulley design to use at home clinics hospitals etc. Very useful recommended by doctor's. Powder coating on pulley , All these features makes Cervical Traction Kit the best..